Many times in life you are running towards a goal, only to realize midway that it was a mirage. And when observed closely you will see that you don’t even have a handful of memories to cherish, rather you are only left with a fistful of sand and loads of unanswered questions in the name of it. A Secret Wishlist is a book which not only makes you question many things but also makes you realise the importance of simple things like trust and love. Does true love really exist? Can a kiss change your life? 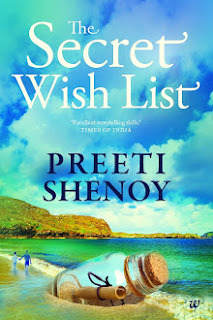 Preeti Shenoy is one author whose every book has been reviewed on my blog till now and yes she needs no introduction. You can read my previous reviews here where I talk about her, my inspiration, the person who made me realise that I can write and for that I am forever indebted to her! In life there are times when everything you wish comes true as He seems to be in a mood to say AMEN to everything. This book is about those hidden desires, buried deep down away from the prying eyes and such moments when God simply nods and says AMEN. The Secret Wishlist by Preeti Shenoy is the story of Diksha – a daughter, a sister, a wife, a daughter-in-law, a mother – all this and much more but herself. She has gotten so used to this daily rut that she has forgotten to listen what her heart wants. This book is a story about her journey of finding her own self. An unexpected incident makes her realise the importance of living life the way she wants to and be happy. So is born a wishlist as she pushes her heart to tell her every wish .A chanced meeting with an old friend, makes her nostalgic. One thing leads to another and before she can realise she is striking out things on her wishlist at an eerie speed. Preeti is known for her simple and easy-to-connect characters which make you feel they are so existent. They could be you, me or anyone of us for that matter. The sheer beauty of this story is its honesty. You can feel every wish, every desire, every pain and every emotion very eloquently as Preeti has managed to weave a wonderful tale spun around an array of emotions like love and friendship. I was able to connect to the young Diksha more and I strongly dislike this practice in Indian societies where every small act is construed to be sin and the person punished even without being given a chance to defend. Teenage is a very delicate age for anyone to be in and a person tends to sway a lot during this time if not guided properly. I wish parents read this book and understood the real emotions hidden behind a confused teenager rather than prosecuting them like this. This book makes a light read and is simply un-put-down-able mainly because of the emotions involved. I had to keep it down in between for a while and though I was doing something my mind was constantly with Diksha, trying to think what would have happened with her now. I thoroughly enjoyed this roller coaster ride with Diksha as she took me through some of the happy and sad moments of her life. I have always admired the way Preeti deals with some very serious social issues. In this book also, she has managed to create a wonderful impact with the way she has presented an unhappy marriage and a divorce. I would recommend this to all women, especially because it tells you a very important secret to living - Listen to your heart! And who knows it might push you to write your own secret wish list making you embark on your own journey of self discovery! An excellently written book with a very powerful message – LIVE- don’t just exist! This book is like rasogulla. Sweet, sugary, watery (it makes you cry at some moments) melts in mouth (Melts your heart), light and fluffy (it has some really beautiful moments which can be classified like this) and delicious. Loved the review. Was waiting for it! I have not yet read the book, I am sure once I start reading I will keep down the book only after finishing it. Will try and do a review too. Oh you should read it Arti, am sure you will like it too....! Sure, will wait for yours.